Last week, we hosted the third of five Artist-in-Residency retreats this year. This special program, established in 2015, celebrates the commitment and gifts select authors and illustrators have made to the field of children’s literature. The program, along with its matched scholarship funds, upholds our promise to support all writers and illustrators at every level of their careers. To date, Meg Medina, Laurie Halse Anderson, Eileen Spinelli, Matt de la Peña, Jerry Spinelli, Suzanne Bloom, and Kathy Erskine have worked alongside writers and illustrators as they’ve pursued their own projects during our residency retreats. They’ve kindly offered informal feedback and support to all in attendance. 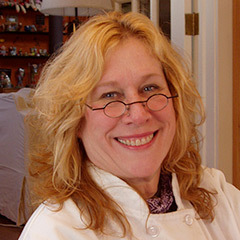 Author and illustrator Denise Fleming is our next artist to visit the retreat center for her residency. Denise generously gives of her time as a mentor to many of our programs, including Color, Light, Line, and Texture, which she hosts with Ashley Wolff, and Super Children’s Book Boot Camp, which she facilitates alongside Pat Cummings and guests. Each time Denise visits, we are grateful for her charming energy and poignant critiques as well as her spectacular, playful art and words. 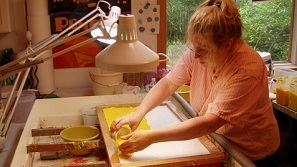 She embraces the child in her work with vivid colors and crisp language and guides others as they search for the art and words needed to write and illustrate for children. There is much to see and learn from Denise’s thoughtful processes. 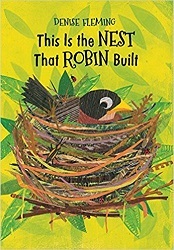 She will also have early copies of her upcoming book, This Is the Nest That Robin Built. With this new book comes a new style for Denise: printing and collage. Despite the changes, her vibrant colors and child-centered prose remain true.